This morning I applied all the new changes to our Ushahidi instance. I would like to say that everything gone soft and good. but unfortunately guys, it did not. I will attach an image about the behavior before (right) and after (left) of the installation. You will realize that we are losing information (posts). vendor.f91c1809641b2256de4c.bundle.js:9 Error: Bounds are not valid. ..js$:115 Uncaught Error: Cannot find module './en-US.js'. But now we have discovered something new! [David Losada, Ushahidi] mm I think the latest commits are older than a few minutes go..
[David Losada, Ushahidi] so .. which git commit did you build that was still causing those errors? then, it is necessary re-update the API using ./bin/update command. Check on hashed/not hashed was reversed. [David Losada, Ushahidi] mm maybe you are not pulling from our repository? [David Losada, Ushahidi] what does git status show? and have 2 and 2 different commit(s) each, respectively. but, why before I was updating without any problem and now I have to apply these changes? what is the meaning of " be running things from your own"
will we be up to date with the Ushahidi's changes? Why has it stopped merging, and why is it something new in the procedure? I did not remember about this! [David Losada, Ushahidi] was that just a change in how long the sessions last until they expire? I have change the code! Both independently or both on the same command line? [David Losada, Ushahidi] that’s just this time .. then whenever you want to pull our changes ..
every time I have to apply both commands? [David Losada, Ushahidi] “git pull origin” ? as you can see, mine too! angular.js:13920 Error: Bounds are not valid. [Will Doran, Ushahidi] what is the most recent commit in git log? [Will Doran, Ushahidi] for client what is the most recent commit in git log? should I apply the same changes in the command line? Or should I apply the previous order? [Will Doran, Ushahidi] did you make any changes to the client? [Will Doran, Ushahidi] and what commit are you at now? [Will Doran, Ushahidi] do you need to log in? what can I do about this loss? I would like to ask you something else. Now, with these new changes. If I want to update the API, is the scrip different? [Will Doran, Ushahidi] are the posts actually deleted? [Will Doran, Ushahidi] can you see them in the mysql db? Posts are in the timeline, but they are not displayed on the map. This meant that they are not deleted from the database. [Will Doran, Ushahidi] ok good, when viewing the map are you getting an error in the console? [Will Doran, Ushahidi] that's on the map view yes? [Will Doran, Ushahidi] can i take a look? [Will Doran, Ushahidi] it's definitely uptodate yeah? [Will Doran, Ushahidi] is email sending set up on your deployment? I would like to know if we have a solution. Otherwise, I will be forced to restore the system to an earlier version. Researchers want to see the public posts. By the way, do you remember that bunch of warnings in the client? They are still showing up. [Will Doran, Ushahidi] so I'm looking into it now, it should take a few minutes to fix, can you hang on reverting for 5 mins? But this is something that happens when the gulp build command is released. 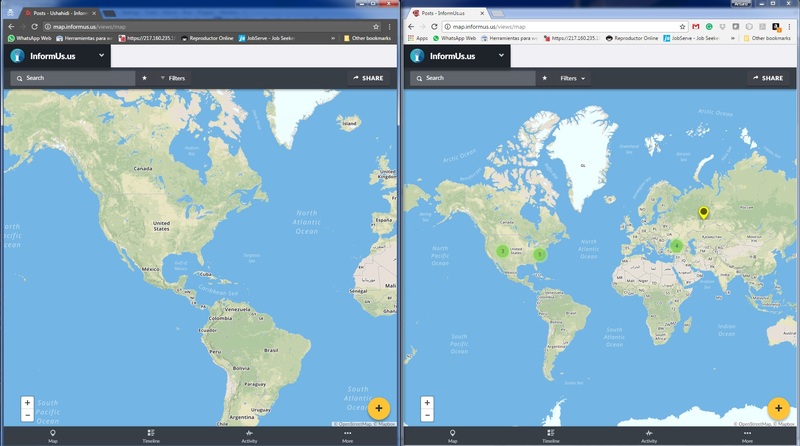 [Will Doran, Ushahidi] could you give me a snapshot of your db before and after migrations? [Will Doran, Ushahidi] would it be possible for you to test the migrations before and after the update? I want to see how the DB has changed and if it's broken, would it be possible for you to share a mysql DB dump from before the migration and one after? Do these mean something to you? [Will Doran, Ushahidi] Thanks for the db dumps, I will take a look this evening! [Will Doran, Ushahidi] no problem, thank you for your time! Thanks to all of you for your help and time!